As I mentioned in my previous post, I had a lot going on this weekend. 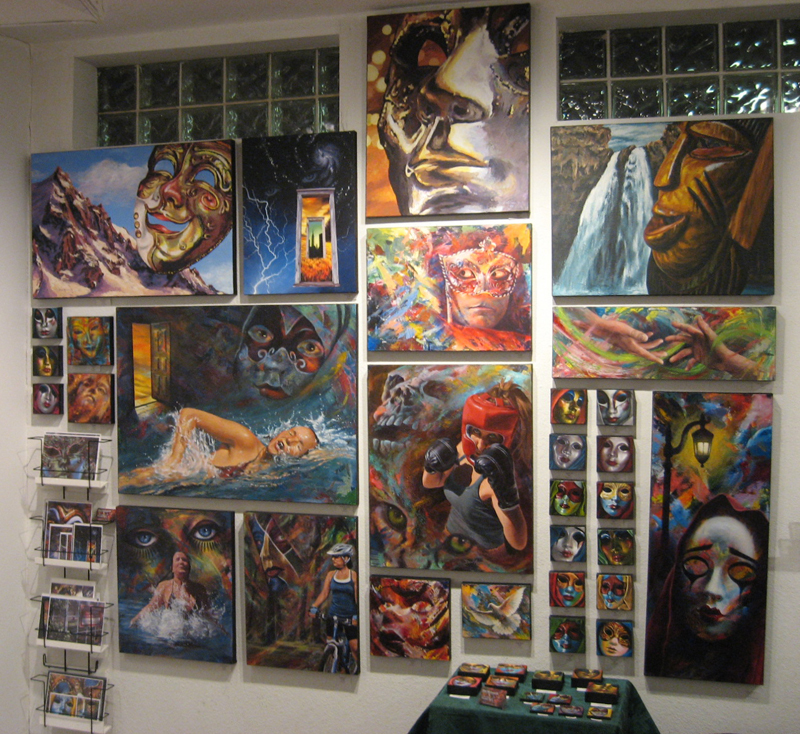 To start with, it was First Friday in Downtown Las Vegas where artists from all around the area would be displaying their wares – including yours truly. The night started out pretty slow but began picking up after 8pm – as seems to be the norm. 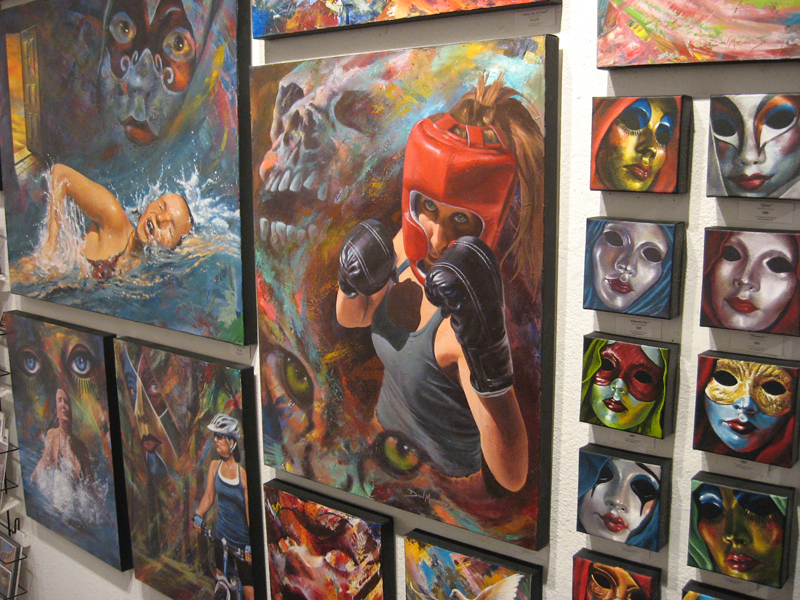 One of my Eye Candy: Skittle paintings (Strawberry) was purchased by a man visiting from New Orleans. He said it made him think of his wife who was still at home and he wanted to buy it for her. 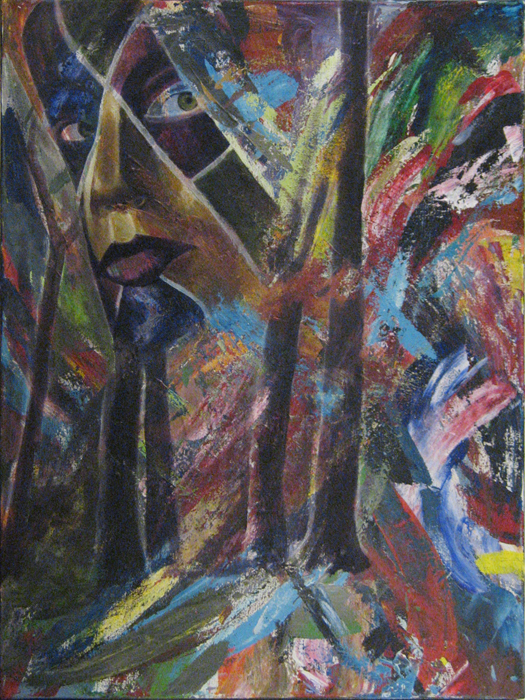 Another of my paintings, Take Heart, was purchased by my friends Tami and Angelo. What’s funny is that as soon as I wrote sold on its tag a lady came over and wanted to purchase it. Luckily, I had a print of it on hand and she didn’t leave totally disappointed. I hate having my back to the class, so I’ve learned how to paint upside down and backwards to make it easier for the class to follow along. In the photo above you can see that we have started laying in the greens of meadow. 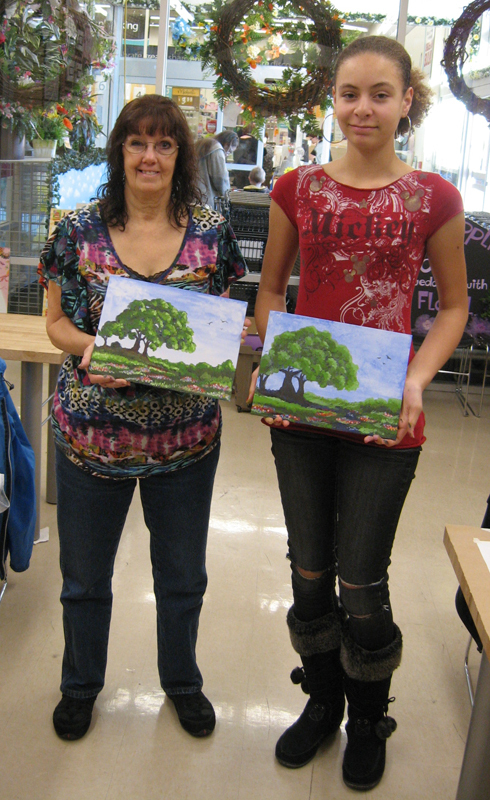 The young lady on the right (who is only 13) had never painted before. Her mother was so excited with how well she did that she plans to join us in a future class. Cool, huh? Now it’s time for me to head back into my studio and get busy. Even though I painted in class today, it’s not the same as painting for myself. Thanks, Ashley, Elle and Joe for being such good sports. You all did a GREAT job with your paintings! This is the first in what will be my new Eye Candy sub-series, Eye Candy: Zotz. I’ve never tried Zotz candy, but I do like their name. 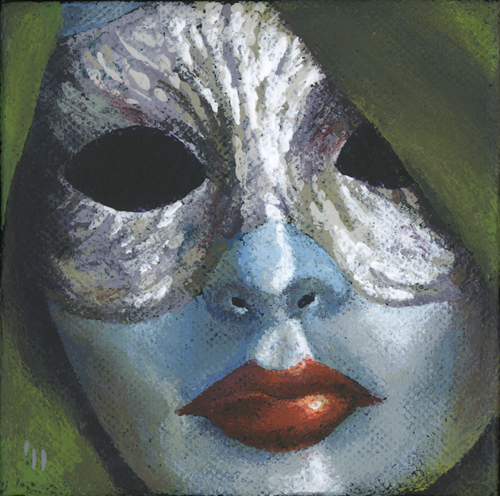 There will be 6 Zotz paintings before the sub-series is complete. As the holidays approach – way too quickly – I wanted to create a lesson plan for this Saturday’s Acrylic Painting Workshop that would have a seasonal feel to it. 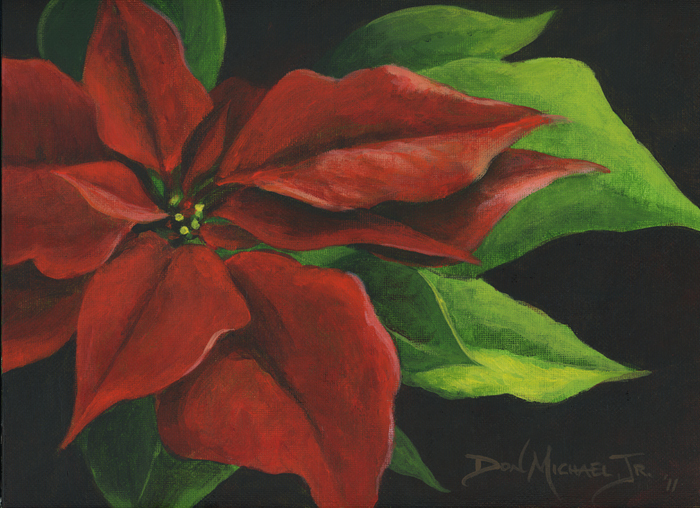 Since I had already scheduled the subject matter for Saturday’s class as Floral, I thought it would be quite appropriate to paint the flower most commonly associated with the Christmas season, the poinsettia. So, for my painting demo at Michael’s tonight I created just such a lesson plan. I look forward to trying this lesson plan out on this Saturday’s victims… oops, I mean students. You’re welcome to come join us. 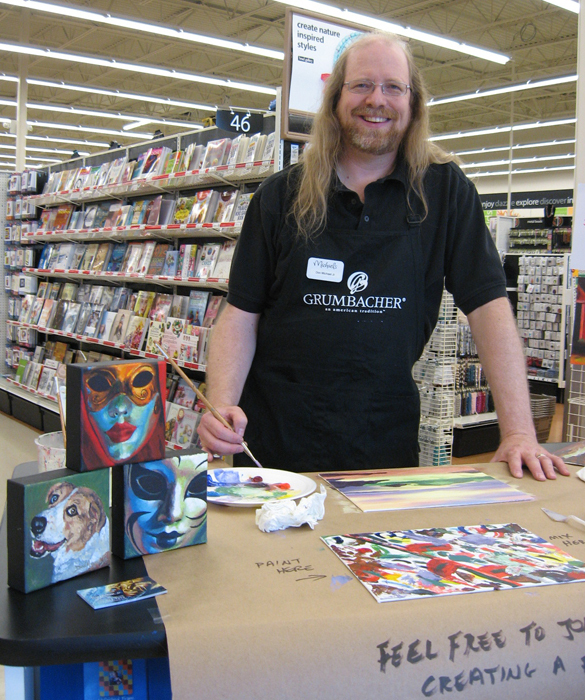 We’ll be painting from 2-4pm at the Michael’s on North Fifth in North Las Vegas. 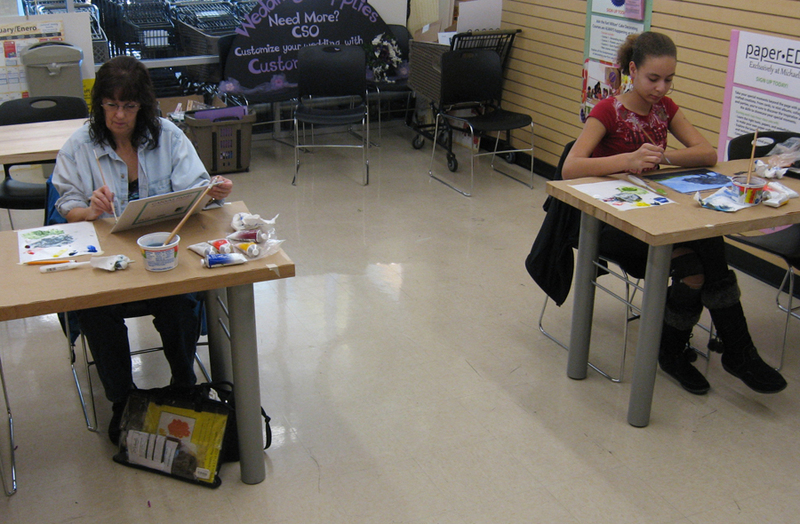 It’s only $25, plus supplies, and you’ll walk out with a finished painting in just two hours! 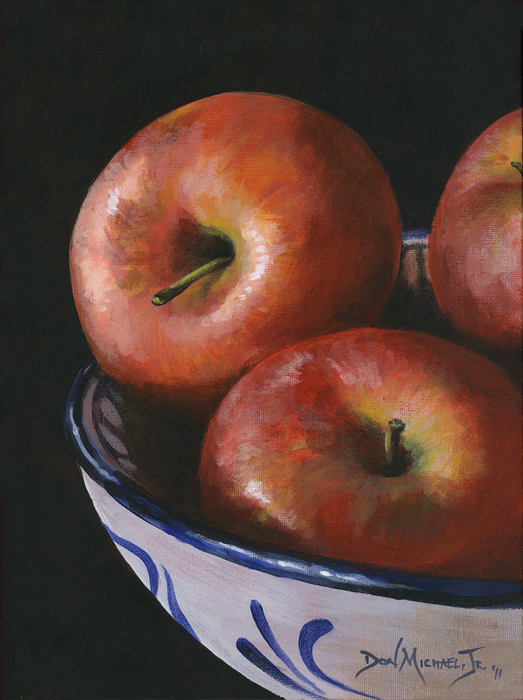 One exciting part of this challenge was that I was painting apples with no true red in my palette. 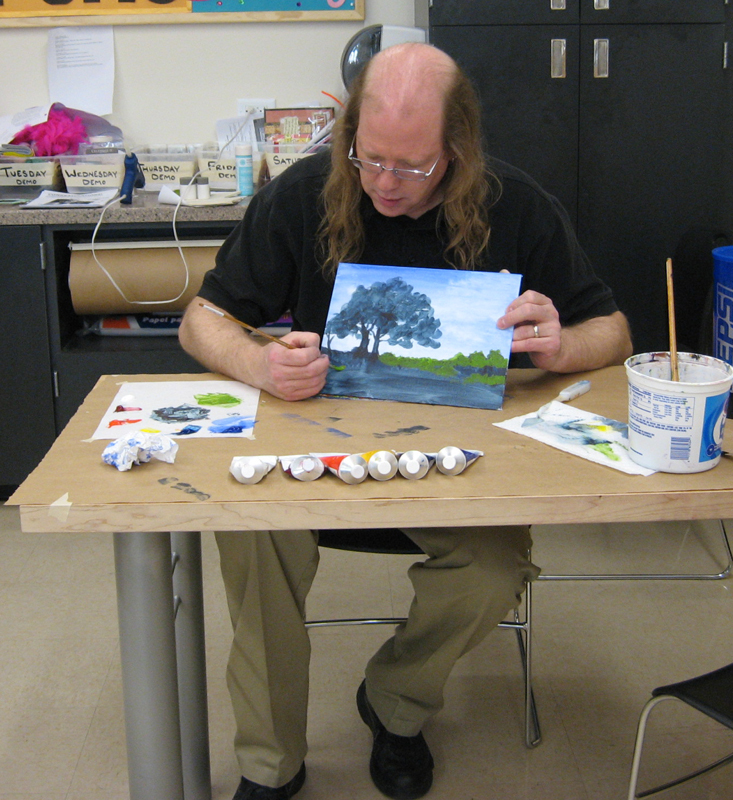 The Grumbacher guidelines for a Still Life Lesson Plan is to use their colors Ultramarine Blue, Cadmium Red Light, Cadmium Yellow Medium, Burnt Sienna, Raw Umber and Titanium White. 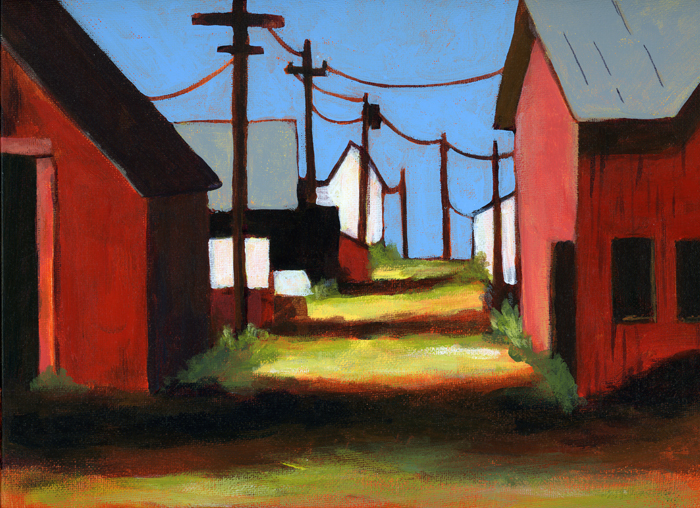 To make the ‘red’ I had to use a mixture of the cadmium red light and the ultramarine blue, creating a muddy red-purple. 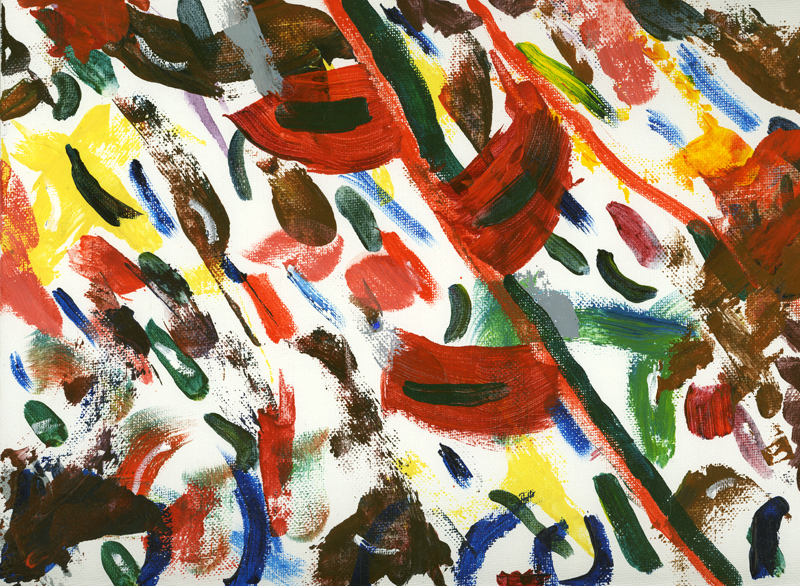 Then, a few strategically placed blobs of green were introduced to help to convince the eye that there is more red in this painting than there really is. Ooooh, this stuff is fun!!! As I mentioned in my last post, I was a little concerned with how well I’d be able to teach the lesson plan I’d created for today’s acrylic painting workshop. 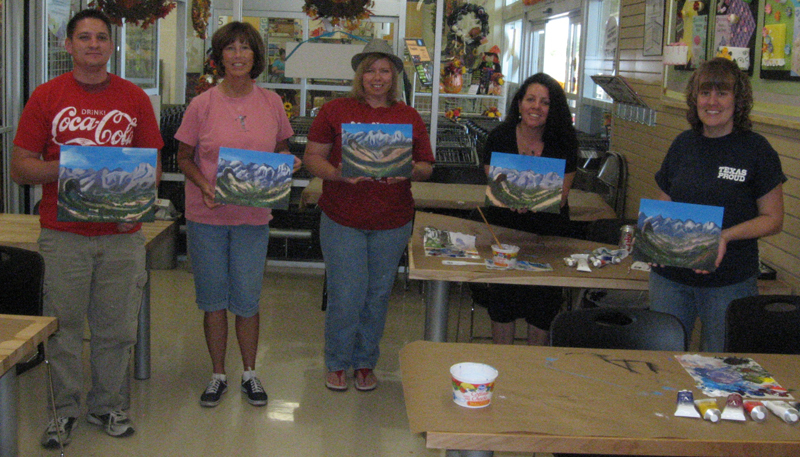 I was worried that the mountain scene I’d chosen could possibly be too complex to simplify into a 2 hour painting class with beginner painters. To add to my anxiety today, three of my students were first-timers and two of those had never even painted before. 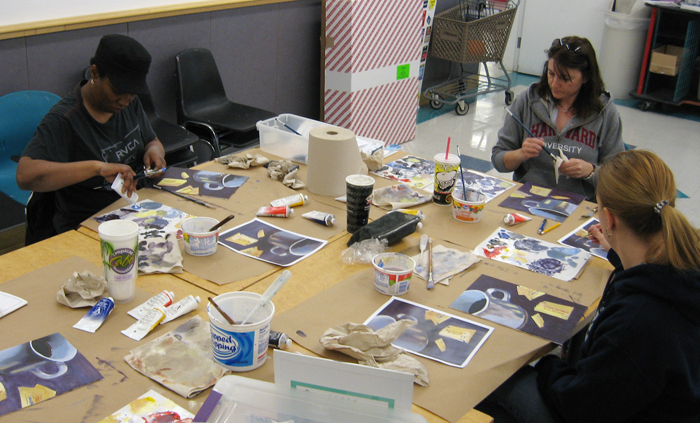 About halfway through the class I realized that we were all stressing a bit about our paintings. 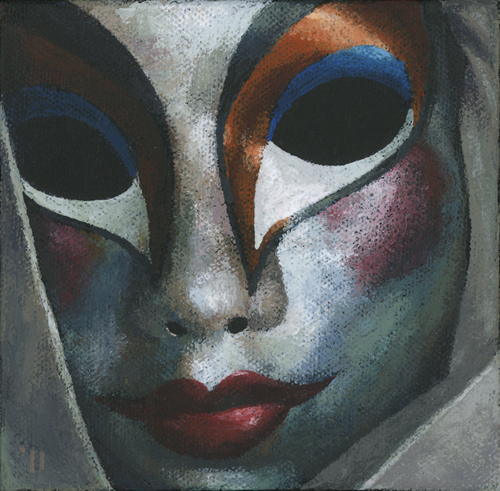 I let them all know that EVERY painting I’ve ever done has a period of time that I absolutely hate it. 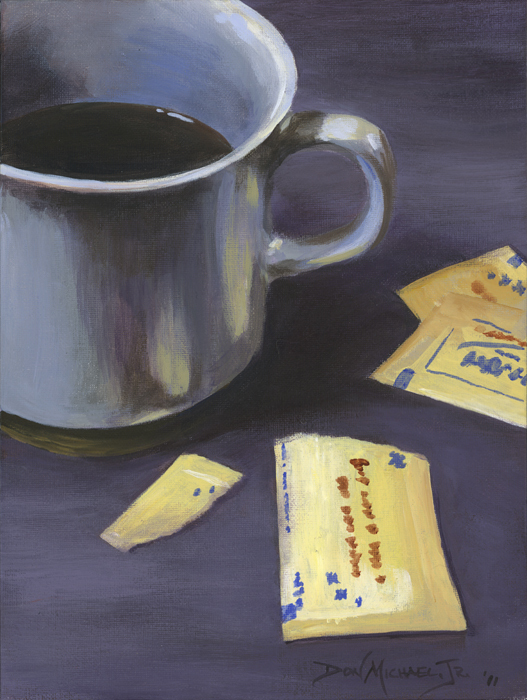 (I’ve heard other artists call this the “awkward period” of the painting, but I think they’re being too nice.) I think that helped to relax everyone a bit and we were able to push forward – and a few of them were even still smiling! Apparently, I must not have done too bad a job today, because all of them plan to come to future classes – and one of them has already signed up for next week. For today’s demo at Michael’s I decided to paint something totally unrelated to one of the lesson plans. I chose instead to do a study of lightning in preparation for a major project I am about to embark upon. 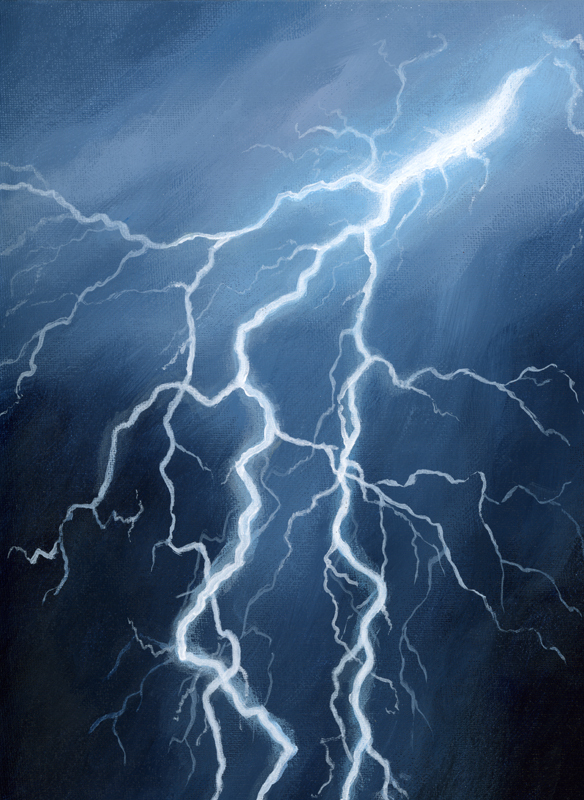 I’ve painted a lot of lightning lately. And, it’s hard to imagine, but the painting I’m preparing to undertake will have more electricity running through it than anything I’ve done to date, even more than my ginormous Heartstrings. My demo was quite well received and I ended up with at least one, and maybe three, new students for upcoming workshops. I also ended up with two new acrylic enthusiasts, one of which can be seen taking a break from working on our collaborative ‘schmeerings’ piece. While Wendell was busy painting, his parents were buying him a nice new beginner’s set of Grumbacher paints and some canvas panels. He could hardly wait to get home to try them out. 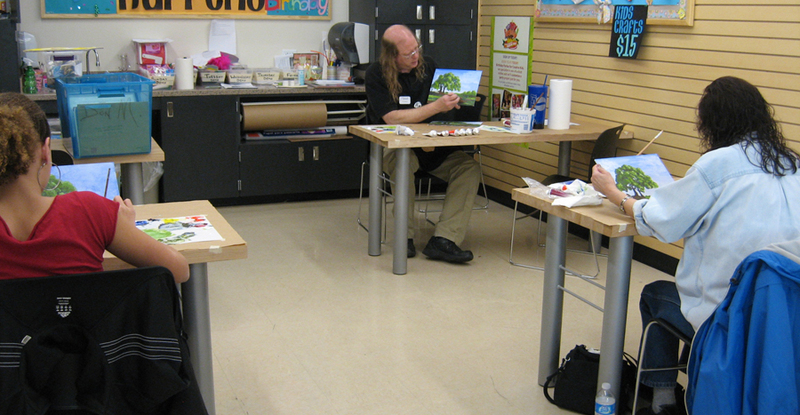 The next time I step into Michael’s it will be to teach this Saturday’s Acrylic Workshop from 1-3pm. If you live anywhere near Las Vegas and have the time, come on out. It’s only $25 plus supplies. 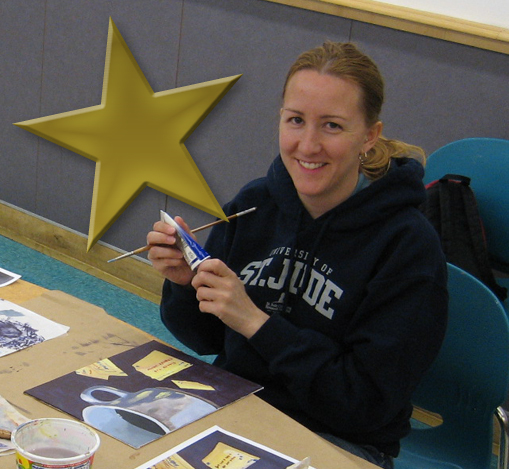 For that $25 you will get two hours of instruction and will walk out with a finished painting that you did all yourself. 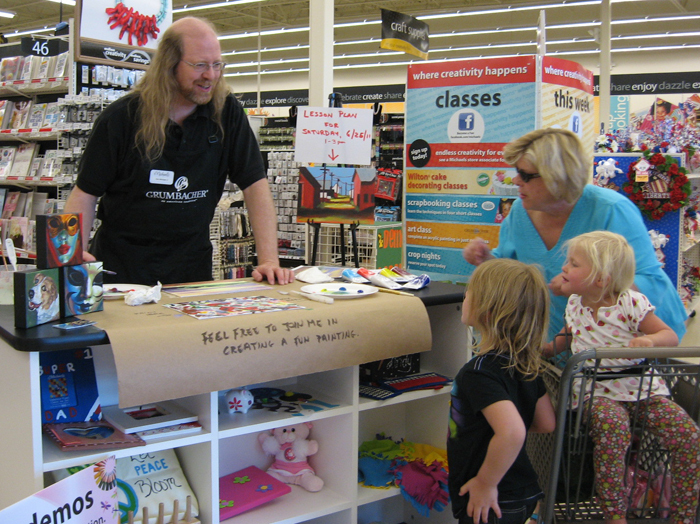 … and here I am chatting with a couple of aspiring artists. 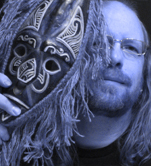 As for what’s going on in my studio, there’s plenty – but very little to share right now. 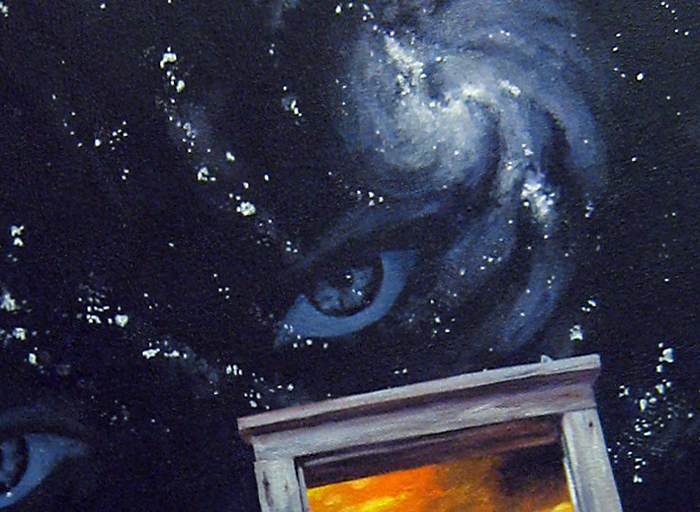 I’m in the middle of a painting which will become a book cover in the near future. I also have a few “Eye Candy” pieces in the works, but nothing close to finished yet. 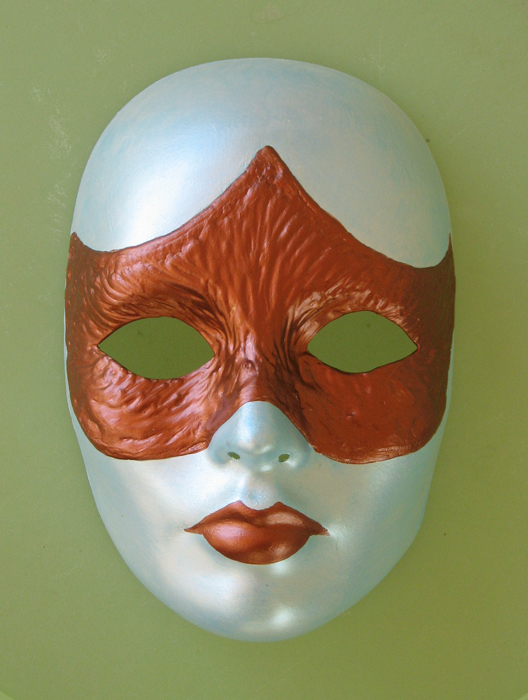 The only thing I’ve finished of late is another mask to be used for reference material for future paintings. Now it’s time to get back into the studio and see if I can’t get some work done. 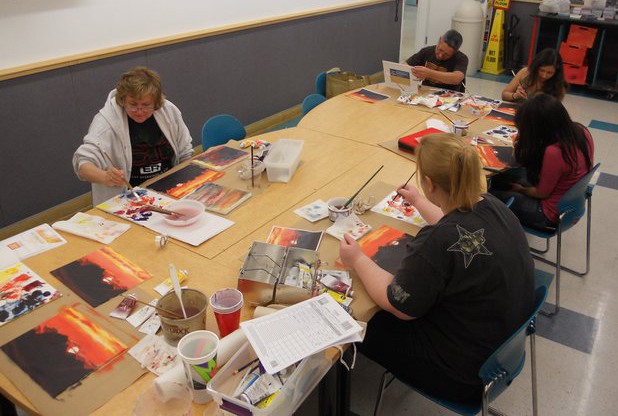 Today was the ‘Soft’ Opening of a new Michael’s Arts and Crafts store in North Las Vegas. 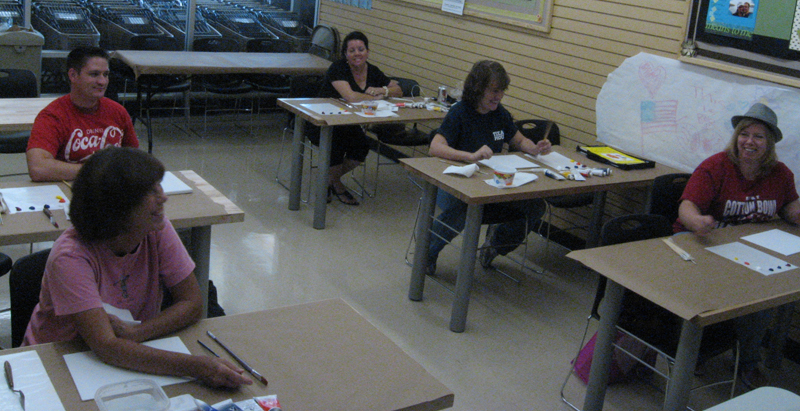 It’s actually the same Michael’s that I’ve been teaching Acrylic Workshops for, but it’s moved to a new location and a brand new facility – and, oh is it nice! The classroom is much larger with a lot more table space. I look forward to putting it to use soon. 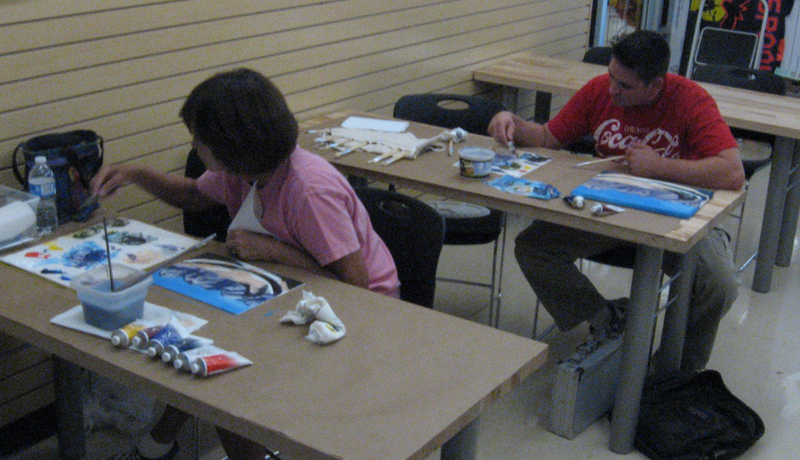 As I was painting, several customers expressed interest in the classes and I even had one new student sign up for this Saturday’s Acrylic Workshop (6/25 from 1-3pm). She was excited to hear that the lesson plan for Saturday’s class will be the one that I was demoing. 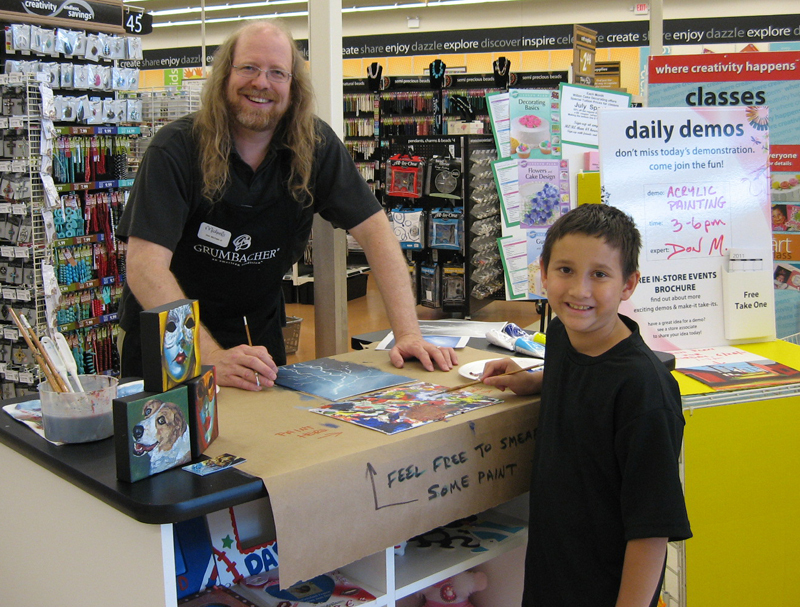 Being a glutton for punishment, I’ll be back at Michael’s tomorrow (6/20) demoing from 3-6pm and Wednesday (6/22) from 3-6pm. Then I will be back next Sunday (6/26) to demo at the official Grand Opening from 10am- 1pm. As I was preparing this photo I finally noticed Kim’s shirt. Perfect! She deserves two stars. 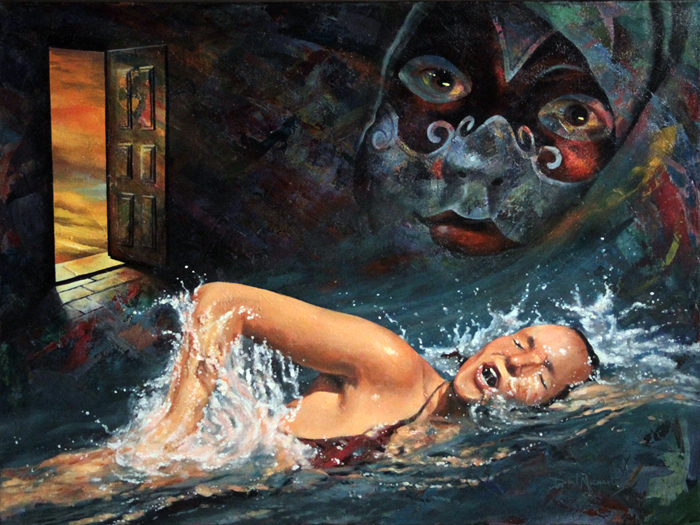 All Photos ©2011, Don Michael, Jr.
I’m in the final stages of a painting I’ve been working on for over a week. It’s a work that will be put to further use at a later date, but for now I thought I’d tease just a little of it to whet your appetite. I should finish sometime tonight, after which I’ll need to start focussing on my lesson plan for this Saturday’s Acrylic Workshop. 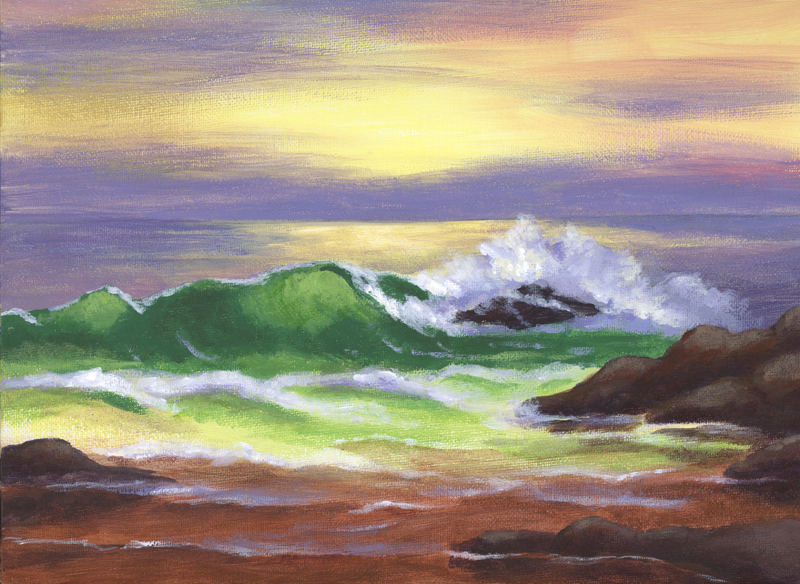 I’ll be teaching how to paint a seascape. Last week my class and I painted a sunset over Red Rock together. 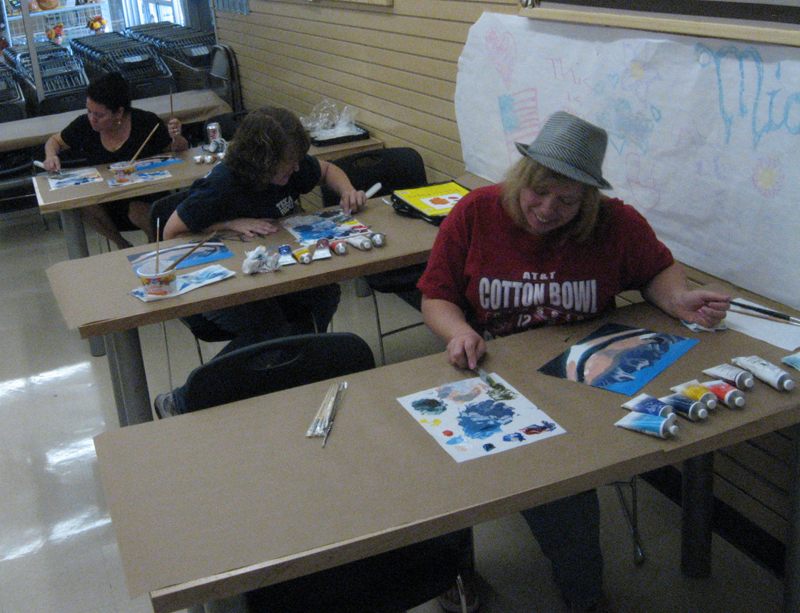 In two hours each member of my class was able to leave with a finished painting they could call their own. Below, you can see them hard at work on their masterpieces.